End of August in Victoria, Canada (BC) the international year of the Global Business Master program “ACT” started. 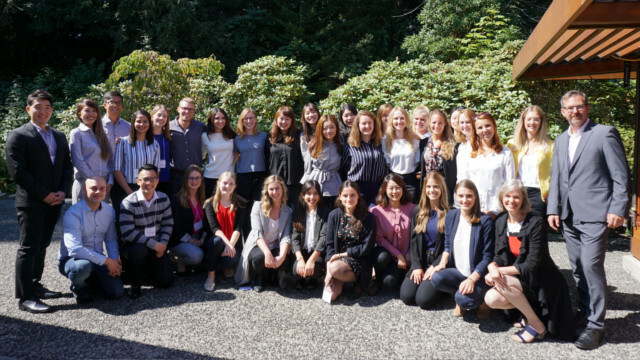 The students from eleven different countries (Canada, Uruguay, Austria, Russia, Albania, China, Taiwan, Germany, France, Mexico and India) got to know the University of Victoria in a splendid autumn atmosphere. The programme of the so called “Orientation Week” included amongst others training on team skills, an introduction in case studies and a crash course in presentation skills. The ACT students will attend joint courses in Canada for the coming ten weeks before travelling to Taiwan mid of November and in February to the JKU. Important contents of the master program are amongst others multicultural teamworking and projects together with local enterprises. The program is financially supported by the IV OÖ. More information on the Global Business Masters (ACT and TROIKA) can be found by following this link.